Capsule Summary: After criticizing Frank’s competence as a surgeon, Hawkeye finds himself question his own ability when a patient starts to spiral in post op. “Sticky Wicket” may focus on Hawkeye but in my opinion it’s Frank who steals the episode with a rare display of humanity. 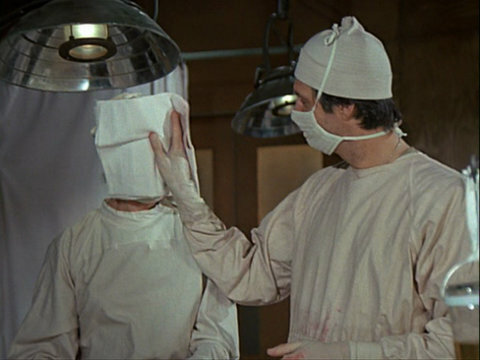 When he tells Hawkeye “Anybody could’ve missed that” in the OR, Frank demonstrates more maturity than Hawkeye, who spends the bulk of the episode sulking. Hawkeye physically attacks Frank and gets upset with nearly everyone else: Ugly John, Trapper, Henry, Radar, and Margaret. Of course, it’s easy to over-analyze a single line of dialogue. Is Frank showing some depth? Is he trying to bury the hatchet? Does he truly believe what he says to Hawkeye? Is it evidence Frank knows he’s a terrible surgeon, especially in comparison to Hawkeye? Considering how quickly and eagerly Frank and Margaret went above Henry’s head to get Hawkeye and/or Trapper in trouble in other episodes, it’s hard to believe neither of them reported Hawkeye for assault. Margaret actually tries to help Hawkeye, because she also cares about her patients, and he rudely dismisses her. More than any other interaction, Hawkeye shutting Margaret down because she was “just assisting” makes him look bad. Hawkeye insults Henry as well but Henry throws an insult right back. Their conversation in the Supply Tent is vaguely reminiscent of–but nowhere near as memorable or powerful–their conversation in “Sometimes You Hear the Bullet” about soldiers dying. The flaw in the episode is the simple fact that Hawkeye doesn’t change. He spends the entire episode acting childish and self-absorbed yet never apologizes or even acknowledges his behavior. He does thank Frank for his “Anybody could’ve missed that” comment. He also calls Margaret beautiful, which could be his way of apologizing. But it’s not enough. Hawkeye’s talent and his dedication don’t excuse how awful he was to his friends and colleagues. A British phrase, “sticky wicket” refers to a difficult or awkward situation. It comes from the sport of cricket. This episode features the jazzier version of the opening theme song. Footage from the opening credits, including the iconic running nurses sequence, is reused in this episode. During the fight in the Mess Tent, Trapper can be seen trying to grab Hawkeye from behind and, later, seconds later running in from off-camera to help Henry restrain Hawkeye. Lynnette Mettey makes her second of three guest appearances as Lt. Nancy Griffin in this episode. Bizarrely, despite having a decent amount of dialogue (presumably once again playing Lt. Barbara Bannerman), Bonnie Jones is uncredited. I felt like after “Sometimes You Hear the Bullet” went over well enough with the writers and producers that they were trying to recapture lightning in the same bottle with this episode . . . it doesn’t quite work, but it’s still interesting nonetheless. HENRY: (Trying to take a nap) This better be important, Radar. RADAR: Uh, it’s Major Houlihan, sir. She’s having a fit. HENRY: Then give her a dis-temper shot. I’ve gotta get some sleep. RADAR: But she says if you don’t come, she’s gonna inform General Clayton. HENRY: 20,000 miles from home and I’m still aggrivated by a woman. Sometimes I think my wife operates Major Houlihan by remote control. RADAR: What should I tell her, sir? HENRY: (Sits up and removes his face mask) You go right up to Major Houlihan, you set your jaw firmly, you look into those cool, killer eyes of hers, and you tell her I’ll be right there. I do believe that Frank’s, “Anybody could’ve missed that,” was perhaps one of his most human moments on the show, and I do believe it was his way of trying to bury the hatchet, I really do. The interesting thing about Barbara Bannerman in this episode (not only because she seems exceptionally hot) was that she was clearly pursuing Hawkeye for a good time, which is odd, because previously in “I Hate a Mystery,” she chastises him (like so many other nurses do) about only wanting pleasure from her. What made her change her mind? And there’s an interesting continuity error in this episode: even though Hawkeye moves into the Supply Tent, if you pay attention in shots that take place out in the Compound, he’s actually staying in Henry’s tent. I also forgot to mention that Richard Baer was frequently a writer for BEWITCHED, and also directed almost every episode of GREEN ACRES. To clarify my earlier statement, Richard Baer, co-writer of this episode, was the BEWITCHED writer that you mentioned, but Richard L. Bare was the GREEN ACRES director.